Music fans are today turning to music streaming services such as Pandora, Spotify and google play but that doesn’t mean the broadcast format is dying. Internet radio is one of the most amazing music discovery processes. It allows us room for just about every music expression there is which is exactly what people need to save themselves from the monotony of traditional radio. Most of the radio stations today are similar, and you will find yourself looking for an alternative soon. However, internet radio stations are unique starting from their names to the story behind their origin and this will get you captivated. 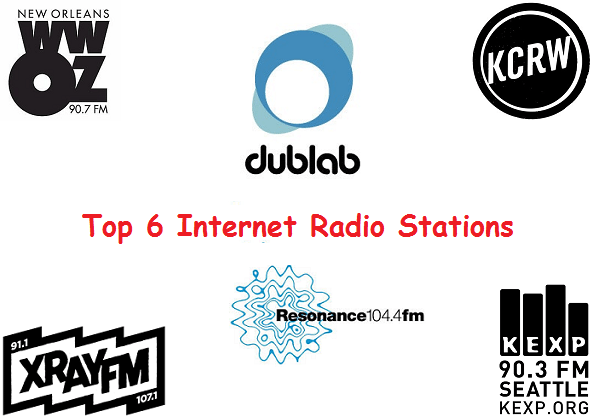 Here is a list of some of the best internet radio stations that you will energize you, giving you a liberating experience of music. The name itself is captivating. It seems like a regular name for a radio station at first glance until you give it a deeper look. WWOZ stands for Wonderful Wizard Of Oz. This is such a great title to live up to and you expect nothing less of the music that they play. WWOZ plays a combination of Blues, Cajun, Country and world music that stands up to the test. It is perfect for listening on a lazy Sunday afternoon. The station is based in New Orleans and this being the birthplace of jazz, WWOZ stays true to heritage playing a rich mixture of jazz in their music mix. It is the best public radio stations in Seattle which stakes its claim to the indie-rock throne the time when homegrown bands like Pearl Jam and Nervana were taking over the world. The radio station plays cool music like US XFM (but way cooler). The station is run in a partnership between Paul Allen’s Experience Music Project and the University of Washington. They highlight the best new and alternative music from across the world. It is the first radio station that showcases up and coming bands over the world and it is also known for it’s live studio sessions. KEXP is the radio station you need to be listening to, if you want to hear new music before all of your online music streaming friends. This is like the south west of America’s answer to KEXP. It is located down in LA, and it deals in a similar aesthetic of music with impressive live studio sessions which they upload to their YouTube channel. They also have podcast goodies for you to subscribe to and to keep you entertained with fresh new music. They are the creators of the popular Morning Becomes Electric radio program a show that highlights new music and live performances by talented indie artists. It is also a great place to catch up on national news. It’s one of the most acclaimed independent radio station in Portland. It serves the sounds of the city’s favorite underground music scene to it’s listeners around the globe. XRAY is a crowd funded station which was formed in 2012 and it offers progressive talk radio programming and a varied selection of great music. In the last two years, it has been broadcasting around the clock with the help of 70 part time DJs. This is not like any other internet radio stations; it has a well-designed website that makes it easy to tune in and browse through the lineup. Resonance FM is one of the UK’s most creative independent radio stations. It is a vibrant and amazing expression of culture, art, opera, and music. It has over one hundred shows on offer working hard to retain that reputation. They have recently improved their website and made changes to their schedule, therefore, consolidating its reputation as UK’s most creative radio station. It’s program roster has over a hundred shows on offer as stated covering everything from opera to African development. Where else did you hear about a show that specializes in 78 rpm records? Hot Club Du Monde is the show that specializes in these amazing records at Resonance FM. It is an internet only broadcast. It showcases the cutting edge of the DJ universe for five days a week. For the two days it isn’t live, Dublab offers each live show for download from it’s website. They have a rotating cast of DJs including some of the best-renowned DJs in the world like Daedelus, Flying Lotus, Teebs and other heavyweights. The DJs are given full control over their shows, which leads to some powerfully odd stuff and a terrific range of music that the listeners are bound to enjoy. Dublab is one of the best streams around the globe for fans of emerging beat music. It is in its 16th year on air in Los Angeles, and it exists as a reminder to people that there’s more to the city other than the gloss of the movie industry.